Most people are a-feared to cook beans, tofu and other strange things, because they don't know how. Thankfully, there is a world of information at everyone's fingertips, called the Internet. It's not just for pr0n, peeps! If there is something you don't know how to do, there's a very high chance you'll find instructions online. I love internet (and pr0n). Why be hungry...eat beans, and be flatulent. Checking over my receipt for the last grocery bill, I see that I bought approximately 9 lbs. of various sorts of beans, lentils, and peas, for about $6, possibly less. One sack creates many meals for me and my husband, and we do eat a lot. We also get a good amount of tofu, and by varying our recipes, it doesn't seem like we're eating the same thing day after day. 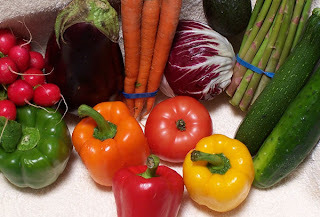 Vegetables, in particular, make each meal seem unique. Last night, I made veggie burgers ( which were a tiny bit 'strange', but still quite tasty) and home-fries, and we stuffed our faces very happily. I was so tempted to get a package of sausages at the store last time, but when I read the list of ingredients and saw it contained MSG, it dampened my spirits. MSG is a carcinogenic salty substance found in many soups, spiced meats, and other things salty. It's not a good thing to eat. It's in those packets of ramen, so don't eat the spice packets (that you college kids). The secret to cooking beans is giving them a good soak. Leave them all in a big pot overnight on your stove, filled almost to the brim with water. They'll take about half an hour to cook, if you do this. Otherwise, you're going to be watching your beans cook for hours, not to mention what your intestines will say after eating unsoaked beans. And that's no fun. I thought I would post some of these recipes, like for the veggie burgers, for they were tasty. Soak a bag of lentils for several hours or overnight. Drain them, and add enough water so they move around freely. Bring those small legumes of deliciousness to a boil on your stove, and simmer for about 25 minutes, so they get nice and squishy. Drain, and go do something else for about 20 or thirty minutes, because you'll be working hard later mixing lentils. Those are tasty tasty good things, and they seem to grow tastier when sitting in the fridge. Presoak a bag of Pinto beans overnight or for at least three hours. Drain the water & wash; refill with water, bring to a boil on the stove, and simmer for 30-ish minutes or until the bean is cooked. (I like mine to be still slightly parboiled, since they'll undergo another cooking session soon.) Let the beans rest for awhile in the open air, to help dry out the liquid after you strain the water from the cooked beanarinos. Meanwhile, chop up several onions, garlic, and whatever other vegetables that you think taste good in Refried Beans. I recommend carrots, celery, avocado, chilies, and oddly enough, Soy sauce. Fry all this stuff up in your biggest fryin' pan with as many of the beans as you can comfortably work. Get them nice and mushy, then add more delicious beans. Texas Pete, ftw! Cheese is nice at this point, as is butter or oil to help keep things moving along. 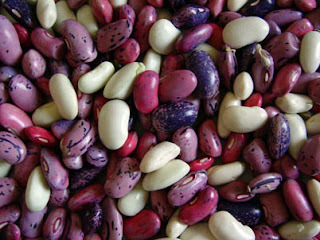 When they are nicely mushed, add the remainder of the beans and give it a gentle stir or two or three. Serve with whatever you like... I recommend tortillas, cheese, veggies, sour cream, salsa... mmm and now I'm hungry. Curse you, Guacamole! 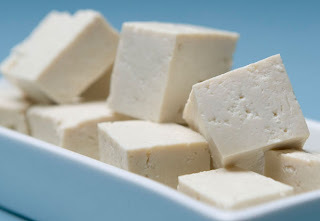 There are simple strategies for cooking tofu as well. Main thing is to drain it well (at least fifteen minutes); the longer you drain it the better though. Afterwards you can bake it in the oven, fry it up in a pan, or even deep fry it. You can serve it up with some sauce, like BBQ sauce or sweet and sour. Or if you prefer you can chop up tofu and add it to another dish like omelets, burritos, etc. It's versatile stuff, so don't shy away from it. Basically, just because money is tight that doesn't mean you can't eat healthy food. Protein is important, and resulting to ramen and canned junk is not the best recourse. You'll find that non-canned legumes are cheaper, and a 20 lbs. bag of rice comes out to nearly half the price by volume than bags under 10 lbs. So stock up on dry goods, and fresh veggies, and you'll be sparing your wallet along with your stomach from undue stress.